Step 1. Use Supertac to secure four skewers that have been fanned out to create the base for a snowflake. Alternatively, you can use a piece of string to bind the sticks in place. Step 2. Trace a small paper circle onto a sheet of cartridge paper. Cut out the traced circle. Step 3. Fold the white circle in half and then in half again. Cut shapes from the folded edges. Ensure you keep some of the fold intact. Open up to reveal the snowflake. Step 4. 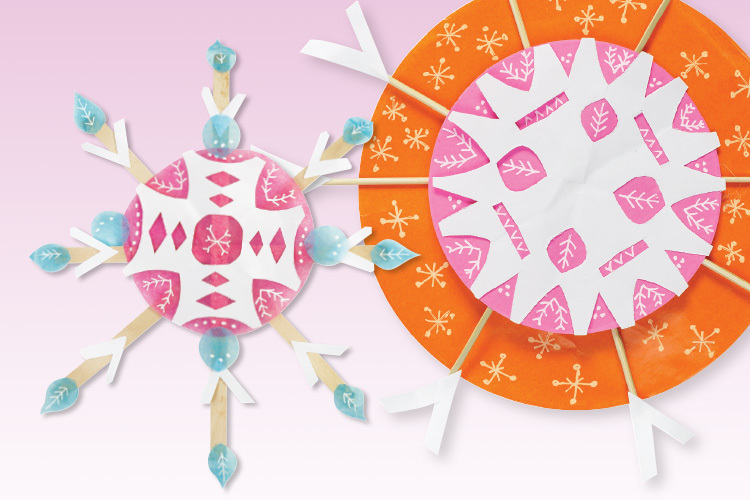 Glue the white snowflake to the small paper circle. Step 5. Decorate the circle with line and pattern using gel pens. Glue to the centre of the skewer frame. Step 6. Glue a large paper circle to the back of the skewer frame. Decorate the circle with line and pattern using pen. Step 7. Cut out a small shape from the remaining cartridge paper that can be repeated eight times. Explore fold cutting to assist with this. Step 8. Glue these shapes to the ends of the skewers to complete the snowflake.